Newton was born in London July 24, 1725, the son of a commander of a merchant ship which sailed the Mediterranean. When John was eleven, he went to sea with his father and made six voyages with him before the elder Newton retired. In 1744 John was impressed into service on a man-of-war, the H. M. S. Harwich. Finding conditions on board intolerable, he deserted but was soon recaptured and publicly flogged and demoted from midshipman to common seaman. Finally at his own request he was exchanged into service on a slave ship, which took him to the coast of Sierra Leone. He then became the servant of a slave trader and was brutally abused. Early in 1748 he was rescued by a sea captain who had known John’s father. John Newton ultimately became captain of his own ship, one which plied the slave trade. Although he had had some early religious instruction from his mother, who had died when he was a child, he had long since given up any religious convictions. However, on a homeward voyage, while he was attempting to steer the ship through a violent storm, he experienced what he was to refer to later as his “great deliverance.” He recorded in his journal that when all seemed lost and the ship would surely sink, he exclaimed, “Lord, have mercy upon us.” Later in his cabin he reflected on what he had said and began to believe that God had addressed him through the storm and that grace had begun to work for him. For the rest of his life he observed the anniversary of May 10, 1748 as the day of his conversion, a day of humiliation in which he subjected his will to a higher power. “Thro’ many dangers, toils and snares, I have already come; ’tis grace has bro’t me safe thus far, and grace will lead me home.” He continued in the slave trade for a time after his conversion; however, he saw to it that the slaves under his care were treated humanely. In 1750 he married Mary Catlett, with whom he had been in love for many years. By 1755, after a serious illness, he had given up seafaring forever. During his days as a sailor he had begun to educate himself, teaching himself Latin, among other subjects. From 1755 to 1760 Newton was surveyor of tides at Liverpool, where he came to know George Whitefield, deacon in the Church of England, evangelistic preacher, and leader of the Calvinistic Methodist Church. 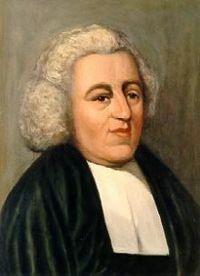 Newton became Whitefield’s enthusiastic disciple. During this period Newton also met and came to admire John Wesley, founder of Methodism. Newton’s self-education continued, and he learned Greek and Hebrew. He decided to become a minister and applied to the Archbishop of York for ordination. The Archbishop refused his request, but Newton persisted in his goal, and he was subsequently ordained by the Bishop of Lincoln and accepted the curacy of Olney, Buckinghamshire. Newton’s church became so crowded during services that it had to be enlarged. He preached not only in Olney but in other parts of the country. In 1767 the poet William Cowper settled at Olney, and he and Newton became friends. Cowper helped Newton with his religious services and on his tours to other places. They held not only a regular weekly church service but also began a series of weekly prayer meetings, for which their goal was to write a new hymn for each one. They collaborated on several editions of Olney Hymns, which achieved lasting popularity. The first edition, published in 1779, contained 68 pieces by Cowper and 280 by Newton. Among Newton’s contributions which are still loved and sung today are “How Sweet the Name of Jesus Sounds” and “Glorious Things of Thee Are Spoken,” as well as “Amazing Grace.” Composed probably between 1760 and 1770 in Olney, “Amazing Grace” was possibly one of the hymns written for a weekly service. The origin of the melody is unknown. Most hymnals attribute it to an early American folk melody. The Bill Moyers special on “Amazing Grace” speculated that it may have originated as the tune of a song the slaves sang. Newton was not only a prolific hymn writer but also kept extensive journals and wrote many letters. Historians accredit his journals and letters for much of what is known today about the eighteenth century slave trade. In Cardiphonia, or the Utterance of the Heart, a series of devotional letters, he aligned himself with the Evangelical revival, reflecting the sentiments of his friend John Wesley and Methodism. In 1780 Newton left Olney to become rector of St. Mary Woolnoth, St. Mary Woolchurch, in London. There he drew large congregations and influenced many, among them William Wilberforce, who would one day become a leader in the campaign for the abolition of slavery. Newton continued to preach until the last year of life, although he was blind by that time. He died in London December 21, 1807. Infidel and libertine turned minister in the Church of England, he was secure in his faith that amazing grace would lead him home. This entry was posted in Evangelical divine, Hymn-Writer. Bookmark the permalink. Комментарии зрителей:Yulia wrote: Леночка, спасибо тебе и Русскому обществу огромное за такой восхитительный концерт хора Улыбка’. Какие красивые, талантливые, одухотворенные детки ..а как поют и играют необыкновенно, душа радуется и хочется надеяться на лучшее и думается Красота и творчество’ спасут мир . Monika wrote: just (want) to say thank you for the concert, it was very nice, the cdhilren sang and played beautifully. Completely different to English style. We are glad we came. Rachel wrote: They gave us so much pleasure. Thank you, Ulybka!